Starting and opening your own business is no small feat. Between finding the perfect location, planning the layout, and stocking up on merchandise, you have a lot to accomplish before your new company is fully operational. If you are thinking about opening a car dealership, one of your main concerns may be figuring out how to make your dealership appealing to potential customers. However, it’s also important to consider cost and how much money it will take to get your car dealership up and running. In today’s post, we will discuss some of the costs of opening a dealership to give you a better idea of what to expect. At MVD Express Montana, we provide a variety of services to dealers in Billings and the surrounding areas. Instead of waiting hours in line just to title your vehicles, MVD Express makes the process quick, easy, and stress-free! We understand that as a car dealer, you have a busy schedule, and we offer fast processing speeds so that we can get you in and out and back to running your business. When you’re in need of reliable motor vehicle services, look no further than MVD Express Montana! Finding the perfect location is one of the most important parts of starting a dealership. That being said, once you find the holy grail of dealership locations, what happens next? Paying for your ideal location is a large investment up front, but unfortunately, this cost is a something that you can’t go without if you are trying to start a business. In addition to factoring in the cost of rent each month for your new space, you will also need to consider how much it will cost to buy all of the office equipment you need to make your business fully functional. Another large investment that you will have to consider is the cost of inventory. Vehicles are not inexpensive, and they can be more or less expensive depending on the type of vehicle that you are planning on selling at your dealership. When you first open your new business, there is a good chance that you won’t have a very large inventory, but as your dealership becomes more successful, you will have the opportunity to add more and more cars to your lot. 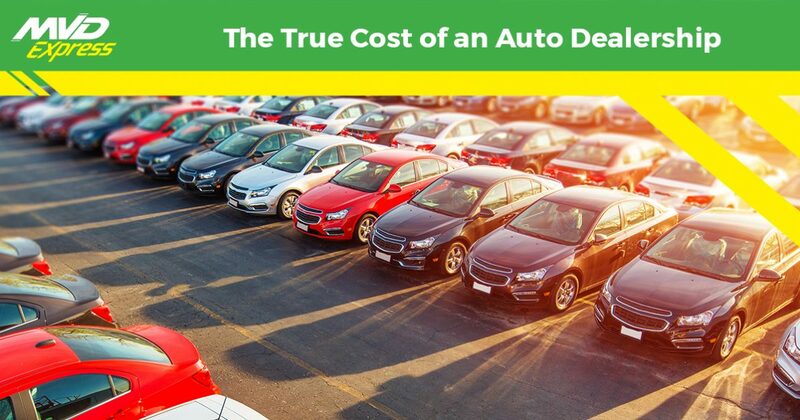 While the cost of your licensing fees will be much smaller than some of the other costs you will have to pay, your auto dealer license is something that you cannot live without. In order to run your business and legally sell cars in your state, it’s important that you take the time to obtain your auto dealer license. Licensing fees vary from state to state, and you may find that your state requires you to pay more for additional services, such as dealer plates or licensed salespeople. When it comes time to start your business, don’t let the stress of paperwork and fines drag you down. At MVD Express in Billings, we offer a variety of motor vehicle services, including titling services for commercial and independent dealers. If you’re looking for an easy and fast way to title your vehicles without having to wait in long lines, look no further than MVD Express Montana, your one-stop show for all of your motor vehicle needs. Visit us today!